June 2015 - Guardian Safety Solutions International, Inc.
Congratulations to the New York Fire Department! 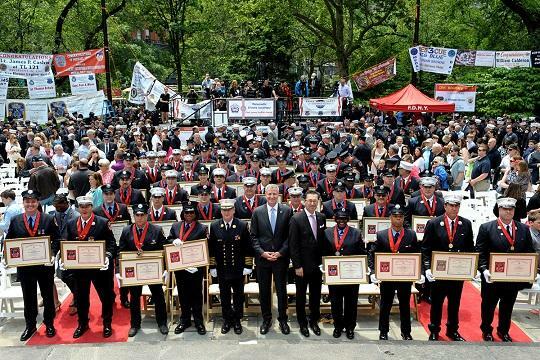 We are happy to congratulate the New York Fire Department who held their 146th annual Medal Day at New York City Hall on June 3rd! Among the brave service men and women awarded were 13 Fire Officers, one Fire Marshall, 26 Firefighters, 2 Emergency Medical Service Officers, four paramedics and four Emergency Medical Technicians. Four fire companies also received unit medals. Mayor Bill de Blasio and Fire Commissioner Daniel A. Nigro presided over the ceremony, and their heartfelt gratitude and pride were undeniably felt in the words they spoke to the honorees: “It’s part of what makes us proud as New Yorkers – this extraordinary department…It epitomizes the strength, the resiliency, the bravery, the professionalism, the sense of innovation – all of which we see is part of what is great about New York City, what we are proud of as New Yorkers – the very characteristics that make us proud to say this is our home,” said the Mayor. For the first time ever, this year’s ceremony awarded medals to probationary firefighters (Jordan C. Sullivan of Ladder Company 105, Justin L. Tallett of Ladder 107, and Marlon Q. Sahai of Ladder 9), whose bravery and discipline in times of need proved them to be promising and stand-out new additions to the department. In addition, the prestigious James Gordon Bennett Medal was given to Captain William J. Grant (Staten Island Engine Company 168), and the Dr. Harry M. Archer Medal was awarded to Firefighter Kevin J. Hogan (Ladder Company 114 in Brooklyn). The Christopher J. Prescott Medal was graciously given to EMTs Shaun Alexander and Kadijah Hall (Station 58) who were not even on-duty when they raced to the rescue of an injured police officer in Brooklyn. Congratulations to the New York Fire Department, to all the recipients of this year’s medals, and to all the men and women who tirelessly serve their city’s people in the name of fire prevention and safety. We appreciate you!